Train Hard. Plan Well. Be Safe. Boost your confidence and fill your mental toolbox with skills to handle technical emergencies. This course not only teaches you the skills and methods necessary to execute a variety of rescue procedures, but it provides the impetus for critical thinking through an emergency. How would you help a canyoneer stuck on a rope? How would you help an unconscious canyoneer stuck on a rope? How quickly could you figure out how to convert a static block to a lowering system? Could you haul a rappeller back to the top of a drop by yourself? Have you ever been in a canyon, assessing a fictional problem and felt helpless? Are your responsibilities in a canyoneering event greater because you’re the leader/organizer? Would you like to be a more valuable team member? 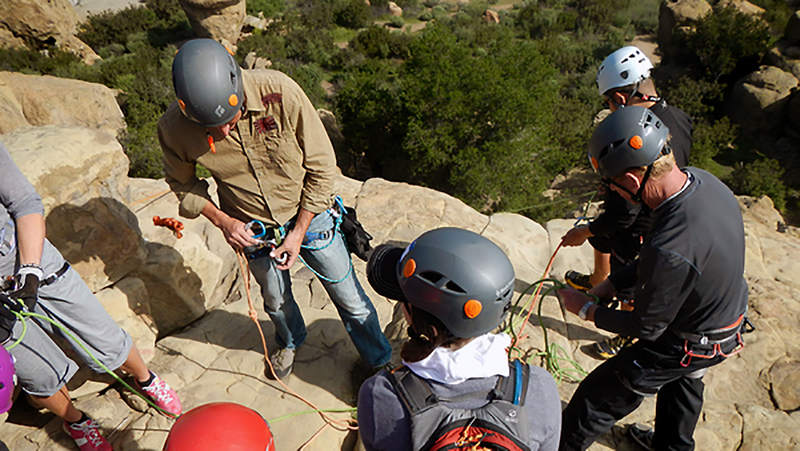 This course is vital for not only canyoneering leaders, but also for conscientious recreational canyoneers who value their own safety and the safety of their party. With the technical skills presented in this course, you could prevent the need for calling in an expensive Search And Rescue team, avoid putting rescuers at risk, avoid spending the night in a canyon, and continue a canyon descent with a non-critically injured teammate. Prerequisite: Participants should have some advanced formal canyoneering-specific training. This course builds on the skills taught in the Uber Adventures’ 3-day Technical Canyoneering Course (ACE-L1), the Advanced Canyoneering Course (ACE-L2) AND the Canyon Essentials Course (ACE-L3). While we are not requiring the completion of each of those courses as a prerequisite, those who have had advanced formal canyoneering training will find it easier to ‘keep-up’ with this curriculum. If you’re not sure if this is the course for you, please give us a call and we can discuss your skills and training. (If you are traveling to Los Angeles for this course, inquire about cheap/free camping/crashing opportunities.) Read company/course policies here.